Laughter comes easy when the mind is less burdened. What holds us back from feeling the joys of life? When we are absorbed in our minds world there is no sunshine to laugh upon. In the place where all of our fears and worries survive the moss grows deep from the dampness of the dark, no one sees’s us laughing, it’s not that kind of place. When the ego is rendered small and you escape just for a moment usually without your knowledge a genuine heartfelt laugh is heard, a beautiful sound spontaneous and lively to fill your Soul and dissolve what dwells in the mind. There is always something to laugh about, it is only our self that keeps us frowning, devoid and deprived. To live as a human is a heavy obligation our responsibilities most often out weight the lightheartedness we crave to have, but we do it to our self we load up our minds day after day convincing our self we must do what is expected, duty and obligation out weights the laughter. When life is taken less seriously and the fears dissolve away a big part of who you become aware and awakened, it then becomes humorous to remember the chaos which once kept you trapped in your unhappy frown. To genuinely be able to chuckle at what once used to hurt you deep inside is a tremendous revelation of courage indeed, the Soul rejoices unquestionably at such laughter. As we clean out the negative patterns of our ancestral behaviours and do away with what has imprisoned and confined our minds, the bars separating us from our authentic Self are removed. Laughter comes easy when the chains that represent our conditioning are freed. Who holds the key to the lock on these metal links, the ones made with thousands of messages that no longer hold the truth of who we are? The key is in your own hand loosen your grip and see for yourself. Each time we laugh we raise the vibration of our internal energies, this positive and supported energy emanates into the world so in effect everyone benefits from your joyful moment. 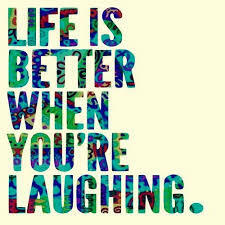 Let us all consciously laugh just a little more often, every chuckle helps.